It has been three months since my husband left and I like to think I've been doing "okay". My job is going well, my relationships are good, etc. etc. I have checked the boxes that need to be checked so I should be totally fine right? Am I fine? What does fine even mean? For the all the different types of social media we have today, most of us are terrible at conveying how we really feel. We are more open with strangers on the internet than we are with our own significant others because we don't want to "bother" them while they are gone. I do this more than I would like to admit. You don't want to burden someone with your problems. They are an ocean away with a wild work schedule and you feel guilty for dumping your baggage on them. So instead you call your Mom and whine to her about how the time distance is a pain and you're sick of it etc etc. But at the end of the day you have come to the conclusion that you can't just shut off communication because it feels better or like you are protecting the other person. Deployments are hard. I like to think of myself as independent enough to live on my own, but I definitely have hit that "deployment wall." That wall that makes you feel like this is going to last FOR-EV-ER and you cannot possibly make it to nine months. You are going to be stuck with five minute phone calls with a 15 hour time difference until the day you die. You look at this massive wall in front of you and think to yourself, "I can't tell them about this. They will worry about me too much on top what they are already doing." But relationships don't work at way. You have to be willing to carry the burden of one another when needed. No matter how messy that can be. Your spouse will be more than willing to listen. This is just not sitting and complaining about every little thing. This is being honest with yourself that just because you think you can do it alone, doesn't mean you should. Time spent apart can wear on anyone, no matter how strong you think you are. It doesn't make you weak, it makes you a human being who hasn't seen your significant other in months and sometimes years. This is a bitter pill that I have had to swallow. I could only improve my communication once I applied what I knew to be true, he wanted to know how I was actually feeling. Sugarcoating does not work. It never has. You don't marry someone because you are going to perfectly happy forever and ever. That is your partner on a journey that can be downright insane at times. It requires you to be honest with what you are feeling, while listening for whatever might be burdening your partner. 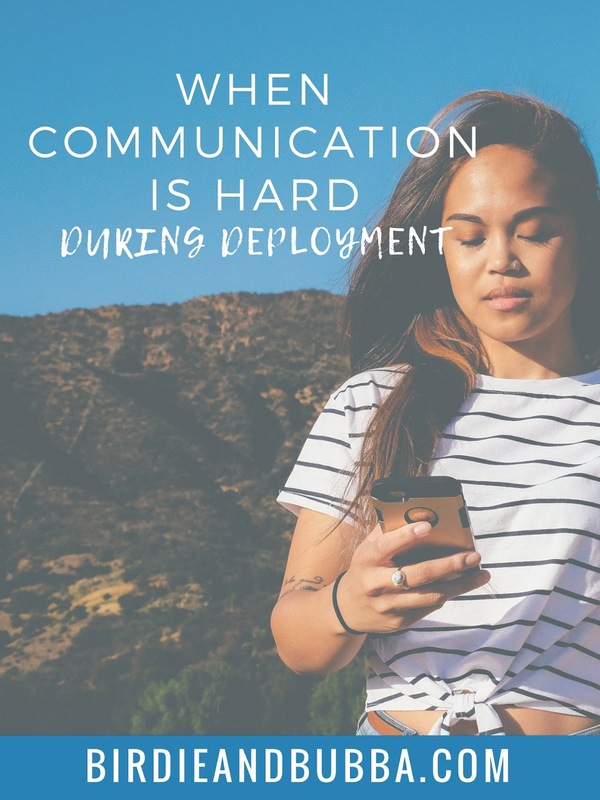 We have been lucky to improve our communication A TON on this deployment but we have had to work for it. We couldn't assume that the other person was on the same wavelength all the time or that they were feeling the same way we were. It takes time but it is nice to be able to confide with the one you love without feeling like you are just complaining all the time. You can lend an ear but you also need to be aware of when you need one too.